Today CALPIRG Education Fund released an analysis of San Francisco lead testing results from the last school year in a new interactive map, finding that half of San Francisco Unified district schools found some lead in the drinking water. “Given that even low levels of lead exposure can cause irreversible loss of IQ, San Francisco Unified School District should take action to get out the lead wherever it is getting into drinking water,” said Laura Deehan, Public Health Advocate with CALPIRG Education Fund. Testing results showed that lead contamination from older pipes and plumbing fixtures is widespread in school drinking water throughout the city. 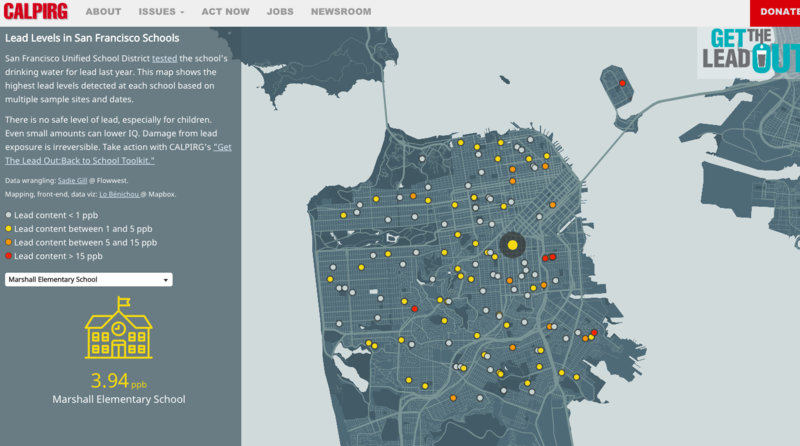 Sixty-six schools in San Francisco found some lead. Sixteen schools found lead at over 5 parts per billion, and six of those schools exceeded the federal standard of 15 parts per billion. This map shows the highest levels of lead detected at each school. However, this is an incomplete picture since most schools in San Francisco have so far tested just a handful of water fountains and taps at each school for lead. Doctors agree that there is no safe level of lead, especially for children, with their growing bodies and developing brains. Even small amount can lower IQ, and damage from lead exposure is irreversible. “San Francisco is not unique in facing this problem,” said Deehan. “Pipes and fountains with lead parts were permitted until 2010 in California. To protect children's health, schools throughout the state must test all their taps and get the lead out wherever it is found." The state requires that schools in California test up to five outlets by July 2019. Schools are currently only required to remove the affected outlets when drinking water exceeds the federal action level of 15 parts per billion. Parents and community members can take action to get the lead out with the Lead Free Schools toolkit.